Barbara Marsh is a poet, musician and teacher and winner of the 2015 Troubadour International Poetry Prize. Her collection, To the Boneyard, is published by Eyewear (2013). As a singer/songwriter, she worked primarily in NYC and London, co-forming Anglo-American duo The Dear Janes. Formerly with Geffen Records, they released three albums and toured Europe and the US. 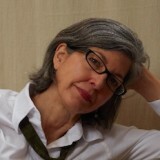 She is the author of the first book-length monograph on poet Ruth Stone. The ballet part is true.